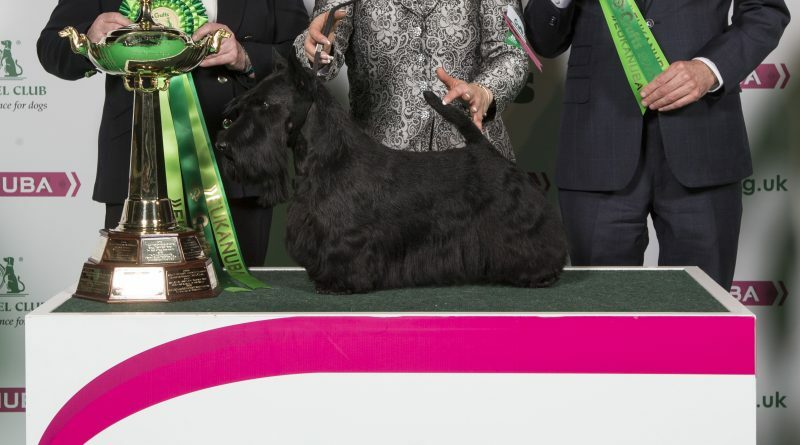 Bopper, a Scottish Terrier from Gettysburg, Pennsylvania in the United States won the Terrier Group title at Crufts 2018 today (Friday 9th March), qualifying for a place in the Best in Show final on Sunday. Bopper (Am. Ch. McVan’s Big Bopper at Beameups), aged 3, will return to the Genting Arena at the NEC in Birmingham for a place in the final at the world’s greatest dog show, Crufts, with his handler Rebecca Cross who co-owns the terrier with Vandra Huber and Dorene Cross. Rebecca will be familar to eagle-eyed Crufts fans, as she is the lady who handled Knopa the Scottie to her Best in Show Win in 2015. She is also, unfortunately, the person responsible for “Tail-gate“; when caused controversy by picking Knopa up by the neck and base of her tail to lift her on and off the assessment table. Ms Cross was aware that this American style was not permitted in the UK, and did not use it in the group competition in 2015, but claims that nerves on the Sunday evening made her forget and revert to habit. She apologised for the incident and any upset caused at the time, and seems to have learned her lesson, as she picked Bopper up around the chest this evening. Hopefully she will be less nervous this Sunday, having been through the experience already. The Best of Group winner is one of 3,623 competitors that has come from overseas to compete at Crufts this year. Dogs from 49 countries are competing for the Best in Show title, including entries from Bahrain, Kazakhstan and Peru for the first time. Speaking after her win, Rebecca said: “This is absolutely unbelievable. To come back to Crufts with Bopper, who is related to Knopa the dog I won with previously, I’m not sure how much better it can get. I was shocked when the judge walked towards me, I was ready to be going home. Caroline Kisko, Kennel Club Secretary, said: “We are delighted to see Bopper chosen as the Terrier Group winner today. Bopper and Rebecca should be very proud of reaching the prestigious Best in Show final – it is an incredible achievement and one that not many get to experience in their lifetime, yet Rebecca has now managed to achieve this twice. Reserve in the group went to the Irish Terrier, Ch Lakeridge Cahal. 3rd was the Jack Russell, while 4th was the Manchester Terrier.